I have been a part of the Pose App community for almost a year now and my lovely followers are over 4,200 🙂 Pose@Trendsurvivor.It is by far my favorite site to start my day. I always check my fellow fashionistas and admire their creative approach to fashion. I get inspired by their collections and their personal style photos. 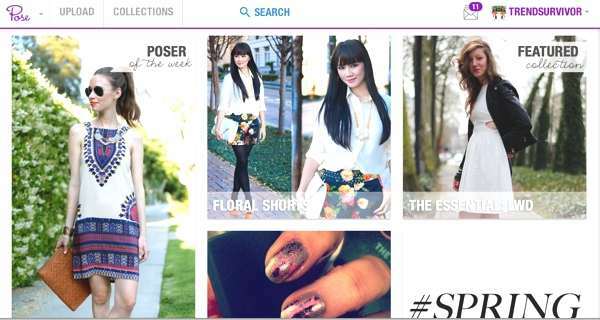 Pose App is the best way to share and discover style! It is the app where you can see and shop the looks shared by the world’s top trendsetters every day. Will you strike a Pose? Even if you are not ready to expose your outfits to our fashion lovers community the uber chic app with over 2,000,000 users you can subscribe and see what we are all up to. You can create collections or just subscribe to the fashion forecast. You could receive an email everyday with the weather in your area and a stylish outfit idea. Will you join the millions of people who are using Pose App to see what to wear and how to wear it? Are you a member? Miranda, you should..you will be a star in no time.